The second Bodleian Student Editions catalogue is now available online through Early Modern Letters Online (EMLO). 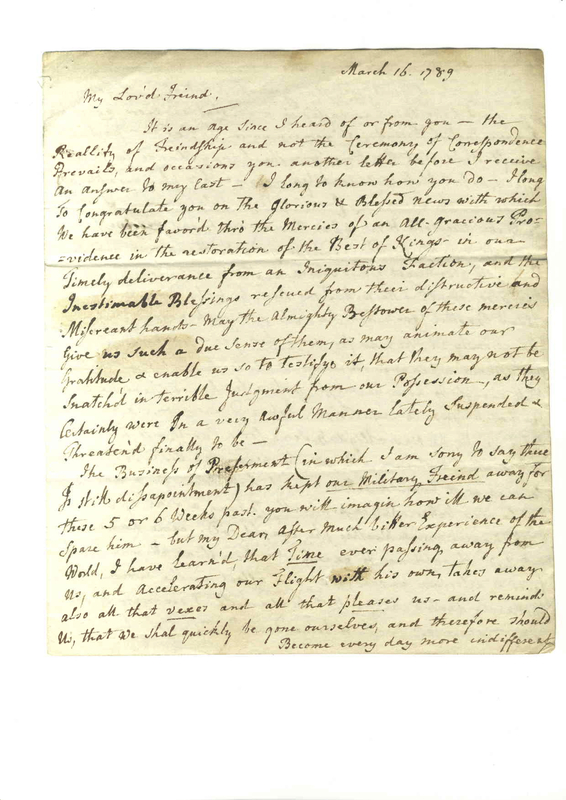 These letters were transcribed in the second of the Bodleian Libraries Manuscript and Textual Editing Workshops, held in the Centre for Digital Scholarship in the Weston Library on 1 December 2016. Details of the workshop programme, along with an account of the first workshop, can be found here. The letters used in this workshop were in a volume of the Carte manuscripts, which mainly comprises the papers of James Butler, 1st Duke of Ormond (1610-1688), Lord Lieutenant of Ireland three times between 1643 and 1685. 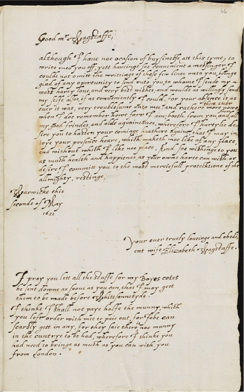 Six letters written by women to Ormond in April and May 1660 were selected, all in MS. Carte 214. Women used italic script in the seventeenth century as most were not taught the ‘secretary hand’ used in legal and administrative documents of the period, and often in private letters also. Italic hands are easier to read for those not formally trained in palaeography, and so more suitable for these workshops, which offer a wide-ranging introduction to undergraduates and postgraduates of all disciplines, many of whom had never previously worked with original manuscripts. I will make the troubell of this leter the briuefer, and only desier, that I may reseve your derections consarninge my comminge over, whoe am the mene time indevoringe to put My Selfe into a redenes to obbay the first sommons that shall Come from you. I think people from different disciplines bring different frameworks of analyses to the table and ask questions you might not think of. a valuable corpus that can be put in the context of other projects in other fields. I love that you come out of the seminar with a citable transcription. The first Bodleian Student Editions workshop was held in the Centre for Digital Scholarship in the Weston Library on 19 October 2016, the first of six planned for the academic year. The catalogue and transcription of letters from the first workshop are now available online through Early Modern Letters Online (EMLO). 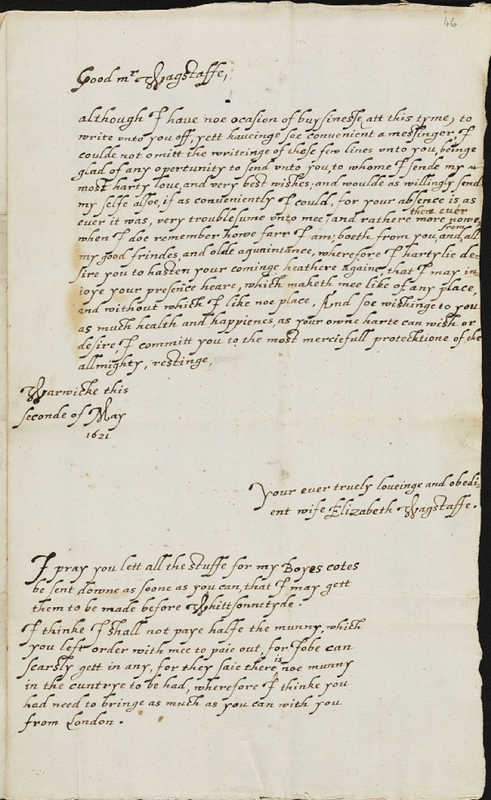 Images of the letters are now available through Digital Bodleian. This pioneering initiative which explores the potential of Bodleian resources and space for cross-disciplinary, skills-based training in textual and digital scholarship, was developed by staff and students as a continuation of conversations that included the Speaking in Absence: Letters in the Digital Age conference, organised by Olivia Thompson, Balliol-Bodley Scholar and DPhil candidate in Ancient History, and Helen Brown, DPhil candidate in English. The pilot scheme of Bodleian Student Edition workshops is a collaboration between the Bodleian Libraries’ Special Collections department, the Centre for Digital Scholarship, and the Faculty of History’s Cultures of Knowledge project. Each workshop brings together staff from these sections with undergraduates and postgraduates from across the University, the users and potential users of manuscripts, to produce online editions of selected letters. Interest in the workshops has been overwhelming, with all six pilot sessions planned for this year already full (72 places) and a growing waiting list for next year’s workshops. Students from a range of disciplines have registered, including members of the History, English and Classics faculties, both undergraduate and postgraduate, as well as students of art history, archaeology and biology. The pilot scheme includes six similar, standalone workshops concentrating on early modern letters. In the course of each session, participants will catalogue and digitally transcribe letters and information. These will be published on the Culture of Knowledge project’s Early Modern Letters Online (EMLO), as Bodleian Student Editions. The workshops introduce students to handling and reading early modern manuscripts from Bodleian collections, transcription and proofreading, metadata creation and curation, submitting metadata and transcriptions into EMLO, licensing digital content, and the possibilities that text at scale brings to research. The participants work from high-quality digital images of the manuscripts, but also have access to the original materials: part of the workshop’s purpose is to encourage students to think about the physical nature of the letter and how this relates to its digital presence. The excitement and interest generated by the opportunity to get close to the original letters was one of the things that impressed me most about the workshop on 19 October. It was overwhelmingly positively received by the students, who described the activities as ‘extremely informative’, ‘a wonderful introduction to textual editing’ and an excellent illustration of ‘how documents can be used to understand networks of thought’. Participants also highlighted the enthusiastic atmosphere and ‘quality of the instruction’. The manuscripts used in this first workshop were six letters written between 1616 and 1622 by Elizabeth Wagstaff [or Wagstaffe] of Warwickshire, to her husband, Timothy Wagstaff, at Middle Temple, London. These letters have been the subject of very little research, and the students showed a keenness to provide explanatory notes on their transcriptions to place them into the wider context of EMLO. The participants enjoyed the opportunity to work with students from other subjects and degree levels. All responded that they are more likely to use archival resources in their studies, and some were keen to carry out further work with the Wagstaff letters as part of their own studies. They were also eager to hear about the possibilities opened by digital methods of research. The sessions are taught by Pip Willcox, Head of the Centre for Digital Scholarship; Miranda Lewis, Digital Editor, Early Modern Letters Online; and Mike Webb, Curator of Early Modern Archives and Manuscripts, all of whom are then on hand, together with Olivia Thompson and Helen Brown, to help the students with their descriptions and transcriptions of the manuscripts. Please note that these workshops are fully subscribed for this academic year, 2016–2017. The catalogue and transcription of letters from the first workshop are now available online through Early Modern Letters Online (EMLO). A collaboration between the Bodleian’s Department of Special Collections, the Centre for Digital Scholarship, and the Faculty of History’s Cultures of Knowledge project, Early Modern Letters Online. We are looking for enthusiastic undergraduates and postgraduates from any discipline to take part in one of a pilot series of workshops in textual editing, working with original manuscripts from the Bodleian’s Special Collections in the Centre for Digital Scholarship, Weston Library. Each workshop will stand alone, and similar content will be covered in each. Textual editing is the process by which a manuscript reaches its audience in print or digital form. The texts we read in printed books depend on the choices of editors across the years, some obscured more than others. The past few years have seen a surge of interest in curated media, and the advent of new means of distribution has inspired increasingly charged debates about what is chosen to be edited, by whom, and for whom. These workshops will give students—the future users of texts for scholarly research—the opportunity to examine these questions in a space designed around the sources at the heart of them. The Bodleian Libraries’ vast collections give students direct access to important ideas free from years of mediation, and to authorial processes in their entirety, while new digital tools allow greater space to showcase the lives of ordinary people who may not feature in traditional narrative history. The pilot sessions will focus on letters of the early modern period. Letters are a unique source, both challenging and essential for historians and literary critics: in the so-called ‘Republic of Letters’ they were a vital means by which the ideas which shaped our civilization were communicated and developed. Participation is open to all students of the University of Oxford. If you would like to participate please contact Mike Webb, Curator of Early Modern Manuscripts, mike.webb@bodleian.ox.ac.uk. The Bodleian Libraries welcome thoughts from students at all levels on ways in which the use of archival material and engaging with digital scholarship can facilitate learning and research. For an idea of the range of collections in the Weston, visit the exhibition Bodleian Treasures: 24 Pairs in the Treasury gallery in Blackwell Hall, where some famous items are illuminated through juxtaposition to a less known item that prompts reflection on the concept of a treasure. The latest themed exhibition at the Weston Library, Staging History, opened on 14 October in the adjacent ST Lee gallery. You can find about the range of services and events the Centre for Digital Scholarship offers. You may be particularly interested in an upcoming training course introducing the Guidelines of the Text Encoding Initiative.